The State Archaeological Museum of Spoleto is located within the monument, the former monastery of S. Agatha, the museum houses the first traces of a civilizationin the area of the castle and old town, dating from the Bronze Age. The evidence and the archaeological finds, including pottery and ceramicsproduction, are preserved in the exhibition of the museum are of particularimportance are the two stones that bear the "lex luci spoletina" in archaic Latin, which provides for sanctions against any desecration of wood consecrated to Jupiter. 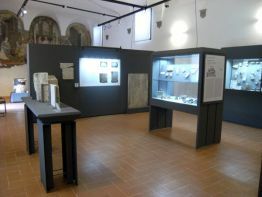 On the second floor of the museum are items excavated from the area of the Nera Valley, including the final Bronze Age urns from the necropolis of Monteleone diSpoleto, the finds from the sanctuaries of Monteleone di Spoleto and Montefranco, funeral from the Hellenistic necropolis and Roman city of Norcia.